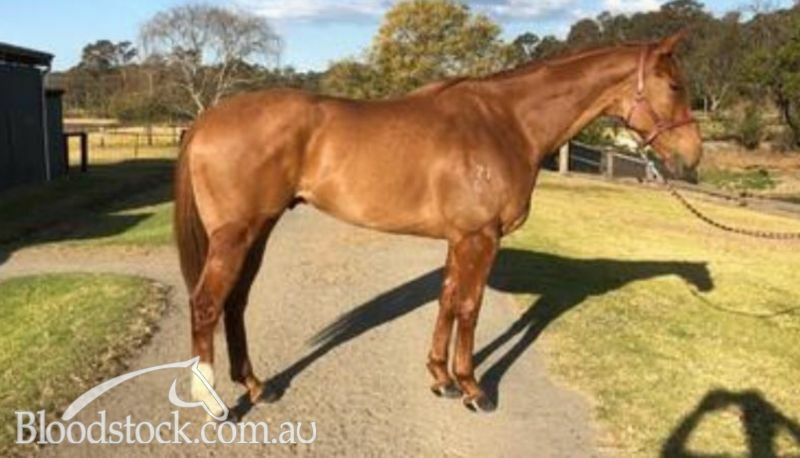 This good looking Gelding has only had 6 starts with only 3 starts the prep.. In his first up start this prep, he ran 2nd at NOWRA over 1100ms on a HEAVY track beaten half a length. His next start at KEMBLA GRANGE over 1200m on the 21st July, he finished 4.5 lengths behind the PETER SNOWDEN Trained LION'S HEAD who was beaten just over 4 lengths in a 100k Saturday Metro race on the 4th August. He has been racing in one of the toughest Country regions of NSW. Drop this boy back a grade and he will quickly pick up his Maiden win! Sir Kingwood (g by Excites) 6 wins to 1400m, NZ$95,460, to 2017-18, Taranaki RC Seaton Park S., Wairarapa RC The Hits H., Hawkes Bay Spring Carnival Starts August H., 2d Levin RC Linwood Park Stud H., Wanganui JC Grant Sweeney Memorial H., Levin RC Hello September the Dial a Prayers H., 3d Marton JC Midwest Disposals H., Otaki Maori RC Hunting & Fishing Otaki H.
Backen Lay (g by Mossman) 6 wins to 1400m, 3d MVRC City of Moonee Valley Celebrating 150 Years H., LF Sign Group H.
Blind Love (g by Bon Hoffa) See below. Smart Chief. 2 wins at 1800m, HKJC Lei Muk Shue H., Peng Chau H., 2d HKJC Braga H., Medicine Alumni H., Des Voeux H., 3d HKJC Jat Ming H., Manicou H., Lei Muk Shue H., Tai Yuen H., Nathan H., Tai Hing H.
Last Moment. Winner at 1800m, GCTC Sky Racing P., 3d SAJC Farmers Union Iced Coffee P., Projection Graphics P.
STARCHEEKA (g Starcraft) 4 wins-1 at 2-from 1400m to 2000m, NZ$76,025, Manawatu Classic, Gr.3, WRC Pacific Jewellers 3YO H., 3d ARC Beach Beats BBQ Boxing Day H., Counties RC Karaka 2012 H., Waikato RC Print House H.
Deneb. Winner at 1200m, 2d SAJC Best Bets H., Pewsey Vale H.
Roeinda (f Lonhro) 2 wins at 1000m, 1100m, A$119,275, 2d Scone RC Denise's Joy S., L, ATC Schweppes H., Harrys Parramatta H., 3d ATC Electro Mechanical Services H., Turf Club H.
Stag Knight. Winner at 1200m, HKJC Kam Shan H.
Sallys Bequest. Winner at 2 in Aust. Salimar (f Marscay) 2 wins. See above. DEFIER (g Dehere) 10 wins from 1000m to 2200m, A$2,976,450, BTC Doomben Cup, Gr.1, AJC Queen Elizabeth S., Gr.1, George Main S., Gr.1, Warwick S., Gr.2, STC Theo Marks H., Gr.2, Canterbury S., Gr.2, Royal Parma S., L, VRC Racing Rewards H., AJC Doherty Partners H., 2d MVRC WS Cox P., Gr.1-twice, AJC Liverpool City Cup, Gr.3, Bill Ritchie H., Gr.3, Epona S., L, STC Sydney Night Racing H., 3d AJC Doncaster H., Gr.1, All Aged S., Gr.1, George Main S., Gr.1, MRC Yalumba S., Gr.1, STC George Ryder S., Gr.1, AJC Warwick S., Gr.2, QTC Sir Byrne Hart S., Gr.2, 4th AJC TJ Smith S., Gr.2, GCTC AD Hollindale S., Gr.2, AJC Frank Packer P., Gr.3, STC Frederick Clissold S., Gr.3. TRAVESTON GIRL (f Flying Spur) 4 wins-2 at 2-from 1200m to 1650m, A$323,450, BRC Brisbane H., L, Qld Tatt's RC Recognition S., L, Breakfast Creek Hotel 2YO H., BRC Mount Franklin Sparkling 2YO P., 2d MRC Thousand Guineas, Gr.1, 3d Gold Coast Guineas, Gr.3, BRC Juanmo S., L, Vertica Capital P., 4th MRC Thousand Guineas Prelude, Gr.2, BRC Bernborough H., L, VRC Cap d'Antibes S., L.
ALIZEE (f Sepoy) 5 wins from 1100m to 1600m, A$1,410,350, in 2017-18, ATC Queen of the Turf S., Gr.1, Flight S., Gr.1, Light Fingers S., Gr.2, Tea Rose S., Gr.2, Everest is Coming H., 2d ATC Silver Shadow S., Gr.2, Magic Night S., Gr.3, 3d MRC Thousand Guineas, Gr.1, 4th ATC Vinery Stud S., Gr.1, NSW Tatt's RC Furious S., Gr.2. ASTERN (c Medaglia d'Oro) 5 wins-3 at 2-to 1400m, A$1,179,550, to 2016-17, ATC Golden Rose S., Gr.1, Silver Slipper S., Gr.2, Run to the Rose H., Gr.2, Kindergarten S., Gr.3, Surf Meets Turf 2YO P., 2d VRC Coolmore Stud S., Gr.1, ATC Roman Consul S., Gr.2. TSUIMAI (c Thunder Gulch) 4 wins-2 at 2-from 1000m to 1800m, A$354,410, STC Gloaming S., Gr.2, Gosford Classic, L, STC 50% Off Membership 2YO H., 2d Gosford Guineas, L, STC Stowe Australia H., 3d AJC Epsom H., Gr.1, Spring Champion S., Gr.1, Newcastle JC Cameron H., L. Sire. AGISTER (g Mossman) 7 wins-2 at 2-to 1300m, A$428,935, ATC Eskimo Prince S., L, City Tatt's RC Tattersalls 2YO P.
READYOR (f More Than Ready) 4 wins-2 at 2-at 1000m, 1200m, A$271,975, AJC Keith Mackay H., L, Flying Doe H. Producer. MR CHARLIE (c Golan) 4 wins from 1600m to 2500m, New Zealand St Leger, L, VRC Spring is the Season H.
MAJESTICALLY (g Maroof) 10 wins-2 at 2-from 1100m to 2400m, A$677,593, AJC Summer Cup, Gr.3, 2d STC Todman Slipper Trial S., Gr.2, Clarence River JC Grafton Cup, Gr.3, STC NE Manion Cup, Gr.3. DEMERGER (f Saithor) 8 wins-2 at 2-from 1400m to 3200m, A$997,250, SAJC Adelaide Cup, Gr.1, VRC Matriarch S., Gr.3, Queen's Cup, Gr.3, Dover P., Bounty Hawk H., Scomeld H., MRC April 2YO H., 2d Moonee Valley Oaks, Gr.2, SAJC Carlton Draught S., Gr.3, 3d MRC Angus Armanasco S., Gr.2, Ballarat Cup, L, VRC Let's Elope S., L. Producer. IMPETUOUS (f Fastnet Rock) 3 wins at 1350m, A$124,950, Wyong RC Mona Lisa S., L, 4th Scone RC Inglis Guineas, RL. FITOU (f Street Cry) 5 wins to 1400m, A$247,335, to 2016-17, Wyong RC Mona Lisa S., L, 2d Newcastle JC Tibbie S., Gr.3. CELLARMAN (g Mossman) 8 wins-1 at 2-from 1400m to 1600m, A$468,175, to 2017-18, ATC Doncaster Prelude H., Gr.3, Qld Tatt's RC Wintergarden S., L, ATC Slipperstyle H., 100th Birthday Louisa Baxter H.
CELLARGIRL (f More Than Ready) 3 wins-2 at 2-to 1200m, A$233,700, to 2017-18, BRC Bill Carter S., L, 3d ATC Flight S., Gr.1. Race Record: 6 Starts 0-1-0 A$5,540. 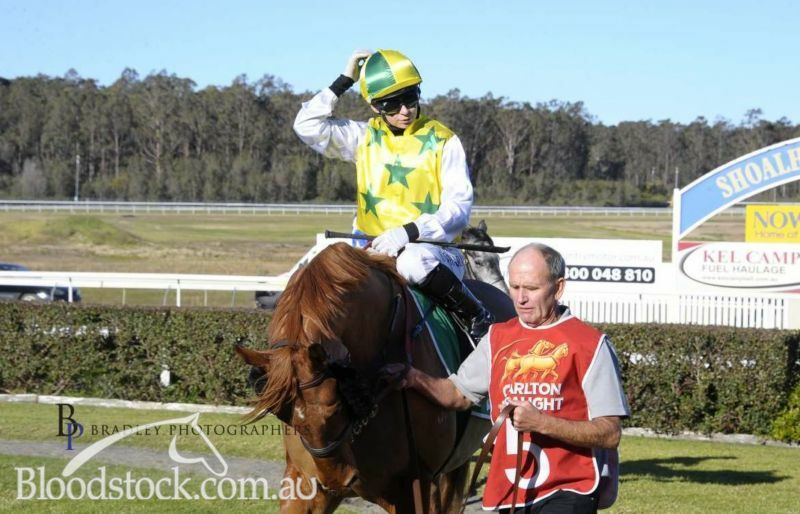 2nd Nowra Ray White Nowra Maiden H.
13/Jun/2017 8th of 8 --trial--ATC Barrier Trial, 900m. Calculated was 1st and Dark Necessities 2nd and Winged Hussar 3rd. 26/Jun/2017 6th of 10 --trial--ATC Barrier Trial, 900m. Calculated was 1st and Hostwin Shadow 2nd and Enfield Opp 3rd.